Our Melissa is in a beautiful spread about organ donation in the June 2011 edition of Ladie’s Home Journal!!! I don’t know what it’s like to lose a child – I think about that quite often – I have no doubt Melissa does as well… But can you imagine stumbling across a video of someone as precious as Melissa, who has your child’s heart beating steadily in her chest – and listening to her reading a beautiful thank-you letter to your child for the gift she received? That night, my Mom and my Sisters went to a play – my adopted niece, Lauren, was performing in the play… After the play, Lauren insisted on bringing my family back to meet the main character – who has cystic fibrosis and is waiting for new lungs and is “amazing” – and they introduced her to Julie D’Agostino… And Julie and her family proceeded to tell my family about the note Julie received from me just that day! There are a bunch of other numbers that have become special to me – 15, 12, 8, 7, 4 and 2 – Tessa, Katie, Wendy, Alex, Kelly and Samara… I will be with several of them this weekend – her volleyball teammates… And this year, the lady that coached #13, and the rest them in high school, is climbing with us too… And I’ve had friends of Kari’s without numbers – Jenn, Kathryn, Christian, Gretchen (Nicole) – climb with me over the years too… I think you have an idea of how I feel about #13 and the girl who wore that number – even though I never met her – I never knew her… Can you imagine what it feels like to be near people who did know her, and loved her – people who she loved? It’s quite special. Jake’s mom sang this song to Jake and Beckham, and to all of us, at the opening ceremonies at the U.S. Transplant Games in Madison, Wisconsin, on July 31st, 2010. Above is the Scadlock family, with their son Beckham – next to the Campbell family. If you’d like to read a little more about them, here are links to stories in The Ithaca Journal, and The NKF Transplant Games website, and editorials in the Press-Citizen and CNBC. Since losing Chase seven years ago, the Coleman family has become dedicated to raising awareness about organ donation. Lon, Trevor and Brandon generate excitement about donation through their plans to run triathlons in all 50 states in memory of their brother. Though breathing with her beautiful lungs is enough – I surround myself with reminders of Kari and her family and friends – and this little work of art is just one more of them… But seeing it come to life in the light reminds me of more than Kari. It was crafted by Chase’s Dad, Buck, and these photos do not do his work justice… When I look at it I also see Chase and his Dad and his family… And I realize what Chase and Kari have done for me and for so many others. We all met at a Chicago Triathlon a few years ago. A few days after spending the better part of a day with Chase’s Mom & Dad, Nancy & Buck, Buck asked me for a digital copy of my favorite picture of Kari – I didn’t know what he was going to do, but I obliged. With two actually – because I have two favorite pictures. Not too many weeks later – my lithopanes of Kari showed up in the mail. I’ve posted about Chase and his brothers, Lon, Trevor and Brandon in the past in posts titled, “Swim, Bike, Run, Chase…” and “Buck & Nancy’s boys… Chase’s brothers.” And “Trying for Life.” And you can read a little more about them at their Tri-for-Life Triathlon Team website. 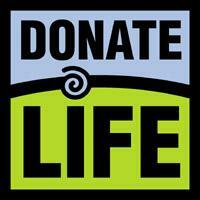 What Does Organ Donation Mean to You? The weather didn’t cooperate – our photo shoots were rescheduled two or three times – and finally scheduled in a way that I couldn’t simply drop in on hers… So one day we just met after work. That day I learned about Jay, and about Jay’s kidney recipient, Julie – and about her passion for spreading the word about organ donation… She learned about Kari, and my similar passion for spreading the word about organ donation and telling others about Kari – and my enthusiasm about just being able to breathe! We connected – and somewhere between the two of us and Gift of Hope, we decided we would be a good team speaking together about organ donation, from the donor family and recipient perspectives… We are a good team – in 2005, Gift of Hope presented both of us with their “Echo of Life Award” for what we’ve done together.